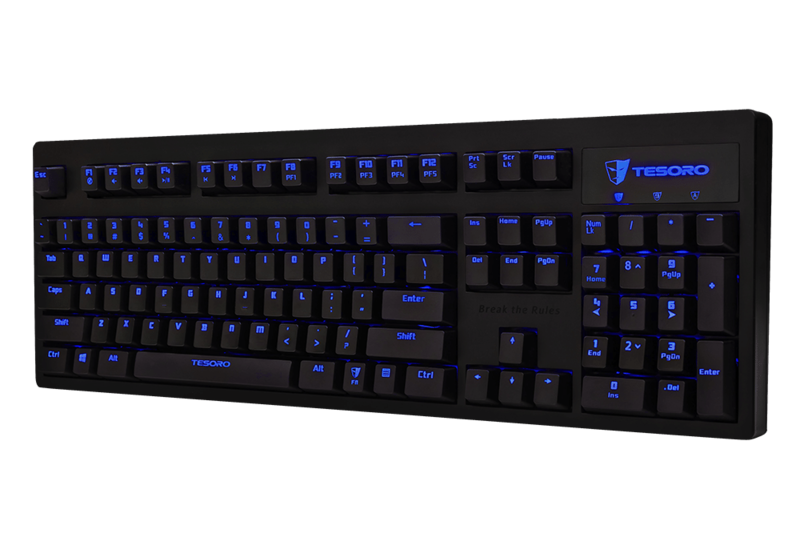 Earlier this year we took a look at the Tesoro Lobera mechanical gaming keyboard, which impressed us with its strong build quality, gaming features and multi-colour backlighting. Today, we’re looking at a simpler alternative named after another famous sword: the Excalibur. This less expensive keyboard uses the same Kailh mechanical switches, but dispenses with the unusual shape and multiple backlighting colours of the Lobera. The Excalibur looks promising, but how does it measure up? Out of the box, the Excalibur is a very normal looking keyboard. It uses the same layout as many other keyboards, with the sole deviation being a Function key in the lower right and some added controls on that layer (e.g. media controls on the F keys). Otherwise, the layout and dimensions seem identical to other mechanical keyboards, including Filco and Ducky. A few visual flourishes have been added; we have a backlit Tesoro logo at the upper right, above the indicator LEDs, ‘break the rules’ above the directional keys and ‘Tesoro’ on the spacebar. The bottom of the keyboard has some small legs, which seem to rest at a higher angle when extended than most other keyboards I’ve seen. There’s also the standard sticker-with-logo here. This Excalibur review unit was equipped with Brown Kailh switches, which offer a tactile bump but not the loud click that Blue switches are known for. Browns are the most popular colour of switch sold and are often recommended for both gaming and writing. It’s worth noting that these Kailh switches aren’t as well-known as their Cherry counterparts, but are made to the same specifications and feel the same to me so far. In order to properly test the Excalibur, I used it as my go-to keyboard for a period of about a week. I wrote articles like this one, did my taxes and of course played quite a few video games too. Specifically, I played Borderlands: The Pre-Sequel, Counter-Strike: Global Offensive, Company of Heroes 2, Civilization: Beyond Earth and Call of Duty: Advanced Warfare. I found the Excalibur quite pleasant to type on, in large part to its standard layout. While many keyboards seek to change up their layouts in order to differentiate themselves, sometimes these changes do more harm than good, and require some mental retraining in order to use at full speed. That isn’t an issue here, as the Excalibur is precisely the same as the majority of keyboards on the market, with the exception of a Function key in the lower right hand side of the board and the corresponding Function layers on some keys. This arrangement is one of my favourites when it comes to keyboard design, and it works well here. As mentioned earlier, Brown switches are often recommended for writing thanks to their tactile feedback and relatively light weight. The Kailh switches in this board served me well for the review period, although they lack the long history of reliability that their Cherry counterparts possess. Still, if their 60 million actuation rating is accurate, they should be just fine. In other regards, this is a good writing keyboard. The Function-layer media keys take a little longer to press than dedicated keys, but are still faster than skipping tracks or muting in software. The backlighting was also helpful for writing in low light. Overall – a great writing keyboard, providing some added features without changing the layout of the board. For gaming, the Excalibur was quite reasonable as well. The switches held up well to my flurry of taps in Counter-Strike and other titles, with the Brown switches providing good tactile feedback and a light weighting. The macro keys and gaming modes worked as described, although I must admit that I didn’t find the need to use either in the games I was playing. As with typing, the addition of LEDs ensures that gaming in poorly lit areas (a common theme for LAN parties and other gamer havens) is quite possible. The ability to switch between three different LED modes (see below) is nice too. The only real issue I found was when adjusting the position of the keyboard on my desk; the little legs that support the keyboard often folded back up when I moved the keyboard forward on the desk. This necessitated snapping out both legs, distracting me from the game for a few valuable seconds. Otherwise, the keyboard was quite reasonable if unremarkable for gaming. 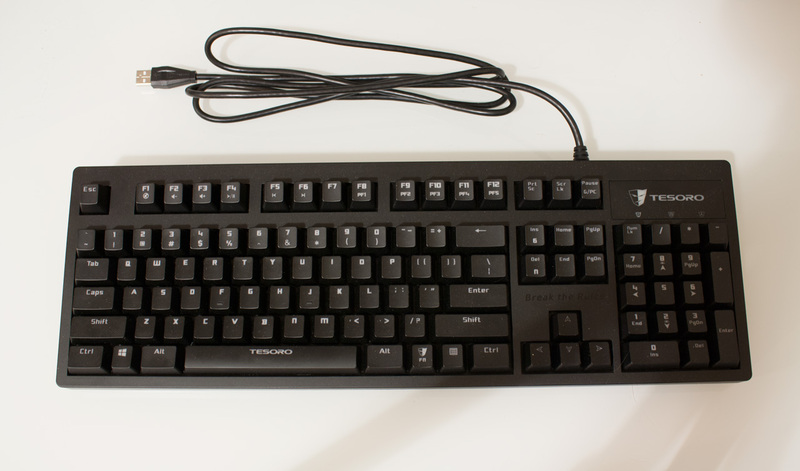 The Tesoro Excalibur is a plain but well-constructed mechanical keyboard, working well for both writing and gaming with a choice of three switches. The Excalibur manages to maintain a standard layout while adding in a few handy features, like macros, media keys, game mode and of course backlighting. The worst thing I can say about the Excalibur is that there’s little here to differentiate it from other keyboards which follow the same formula. 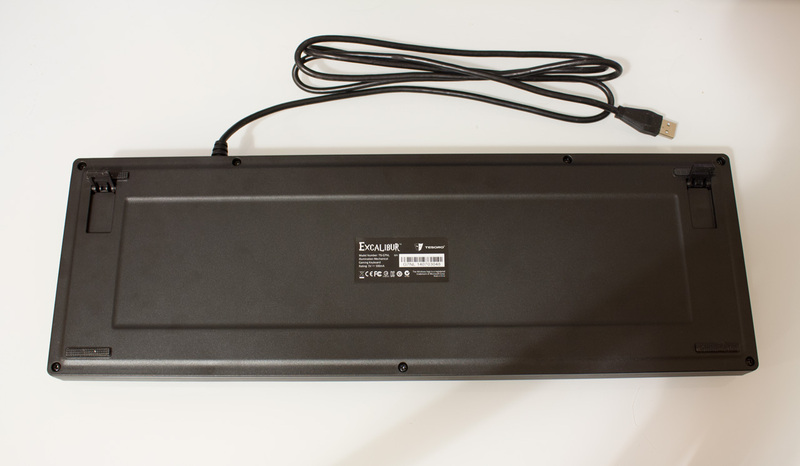 If you want a standard-layout keyboard with backlighting and a few other features, then you can find one from almost every major manufacturer. Other companies distinguish their wares through excellent software, custom LED backlighting patterns or integration with other products, but the Excalibur lacks a unique, must-have feature to set it apart from the crowd. Regardless, the Excalibur is a solid keyboard that provides the essentials without any major flaws. If you can find this keyboard for a good price, then I’d certainly recommend it.